Avocados are on my top ten list of favorite ingredients. I wanted to share this recipe last week on Cinco de Mayo (which, by the way, is not a celebration of Mexican independence) but I couldn’t find any good guacs at the last minute. So now, on the eleventh, I’m sharing this Once de Guacamayo recipe. If you want to make guacamole and can’t figure it out on your own you’ll find recipes that call for 4 or 8 or 12 avocados, and piles of fresh tomatoes, peppers, onions and more. Unless you’re feeding a crowd it’s way more than you want to make and all that chopping and slicing and dicing is a lot of work for a simple snack. So here’s my shortcut. Two ingredients. Avocado and salsa. Lime is the essential third ingredient and if I have some fresh cilantro anyone who eats it will swear I made it all from scratch. Here’s how it goes. Cut an avocado in half by starting at the pointy end and sliding the knife all the way around. Twist each half of the avocado in opposite directions to loosen it from the seed. Twist the sides in opposite directions to pull it apart. This avocado is perfectly ripe and ready for anything. Remove the pit by striking it with the blade of your knife. It will slice into the pit and stick. Twist the knife, still attached to the pit, and pull the pit out of the avocado. Remove the avocado pIt by whacking into it with your knife. You can see I've already sliced and diced the avocado half on the left. It's ready to scoop into the bowl. While the avocado is still in the skin, use the knife and slice it one direction and then the other. Make your slices few and far between for chunky guac, and close together in all directions for smushy guac. The diced avocado goes into the bowl first. Use a spoon to scoop the avocado out of the skin and plop it in your mixing bowl. I used a small plastic container that held blue cheese yesterday. (The blue cheese went into meatballs. That recipe will come soon.) It was a handy size for dipping and would be a handy size for leftovers. Add a couple of spoonfuls of salsa to the avocado. Add your favorite salsa. If this is all you’re going to do, mix and taste. But if you’re adding more ingredients wait to mix it so it doesn’t totally turn to mush by the time you’re done. It just takes a small amount of any optional ingredients to make a difference in the taste and the texture. You may need to add another avocado if you get too rambunctious. A little goes a long way when you’re starting with just one avocado. Jalapeno and Serrano slices are ready to dice for the guacamole. The Serranos were green when I bought them, but continued to ripen and turn red. Finely diced peppers: Jalapenos and Serranos are frequent choices; red bells add color and crunch but no heat; habaneros add color and a LOT of heat. The avocado is disappearing under a growing pile of finely diced red onions, green onions, jalapenos, Serranos and salsa. Avocado and options are ready to mix. Lime and cilantro are my essential finishers for any salsa or guacamole. Gently fold the guacamole together and finish it off with the essential optional extras: a generous squeeze of lime juice and cilantro. Guacamole mixed and ready for the finishing touches. When you’re done you can transfer the guacamole from the mixing bowl to a festive serving bowl if you’re serving guests. Or you can just eat it. Which is what I did. Guacamole and a tray of chips. PS – if you end up adding too much heat (like, how could that happen?!) you can add more diced tomatoes. You can also serve it with a plop of sour cream or plain yogurt top. Don’t mix it in, just dip into it as you need to. The dairy will dilute the heat without diluting the flavor. If you have leftovers, transfer to a lidded storage container. Press a piece of plastic wrap onto the surface of the guacamole and press out any air bubbles. Press the plastic wrap up the sides of the bowl and around the top edge before putting the lid on it. Put it in the fridge. I’d planned to take a picture of the storage set up, but alas, there were no leftovers available for the demonstration. Update: I posted this about a year ago and today came across another tasty way to combine these two flavors. These baked brie bites come from Joy the Baker. They are hot little treats on a stick… all full of melty cheese. Joy the Baker suggests Cherry Jam, and she says you can use your personal favorite jelly or jam but my mouth immediately watered for cranberry sauce. This would be a great way to introduce new flavors to kids or anyone who steers clear of anything different. They won’t see the rind on the brie, and they won’t see the lumpiness of the homemade cranberry sauce. They’ll probably just ask for another one. I subscribe to a handful of food and recipe blogs and newsletters so my mailbox usually has a half-dozen or more recipes in it each day. 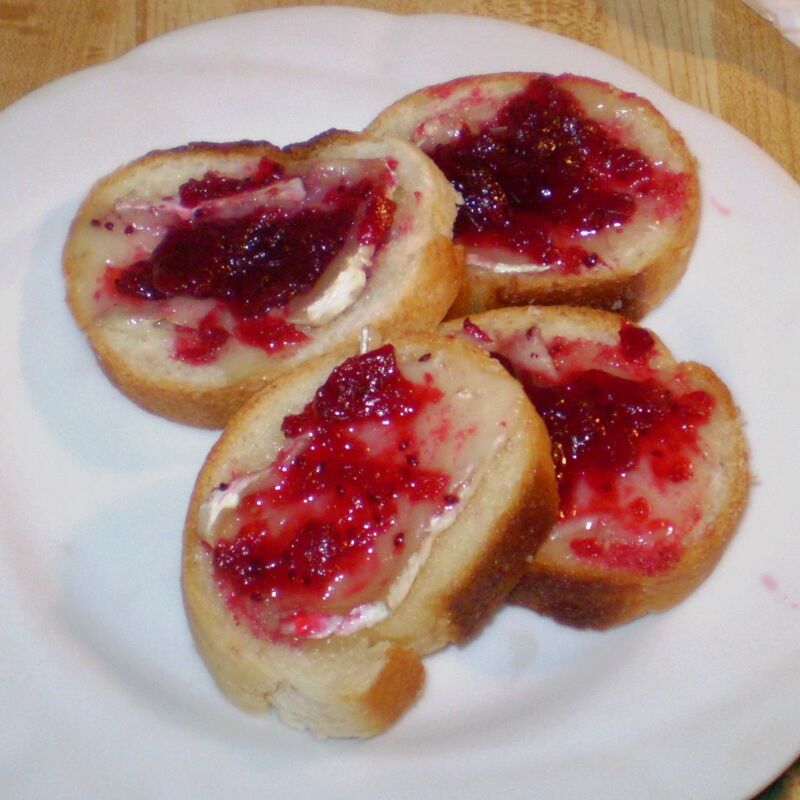 I’ve noticed brie and cranberry sauce in the subject of more than a few emails the past few weeks. Here’s how I put them together. I sliced a small loaf of French bread into slices about a half-inch thick. They went into the toaster oven and I turned the oven to about 325° or so just to warm the bread and barely toast it. I smeared each slice with a thin spread of butter (I happened to have unsalted butter at room temp today) and topped it with a thin—about 1/8″ thick—slice of Brie. Then I slid the baking sheet back into the toaster oven at the same setting for a few minutes. It won’t look melted, but after a few minutes touch the cheese with a knife to see if it’s ready. When it’s soft and smearable it’s time to take it out. Next I spread cranberry sauce on top of the cheese and slid it back in the oven for another minute or so. Just long enough to take the chill off the cranberry sauce. Then I ate them. All by myself. I think I’ll go make some more.